JOHN TARO, managing director of Marimo Land Sdn Bhd, is heading the group’s expansion into Malaysia. Marimo Land is a subsidiary of Japanese developer Marimo Co Ltd, which was founded by Taro’s father Makoto Fukagawa in 1970 in Hiroshima, Japan. It commenced operation as an architectural firm providing designs for affordable condominiums, which met the needs arising from the country’s rapid urbanisation. Marimo became a condominium developer in 1990 and has completed more than 330 condominiums in Japan and overseas since then. The company is one of the leading developers in Nagasaki and was the first condominium developer in Shikoku Island. Since 2009, it has spread its wings to China, Indonesia and Malaysia. Taro, meanwhile, has had an interesting career. With a background in architecture and accounting, he joined the family business in his early twenties. Restless at heart, Taro travelled to a few countries in his quest to find the most suitable place for him to work and migrate. He then settled in Brazil, taking on the unlikeliest of jobs — working on a farm. He eventually settled in Malaysia after falling in love with the country and meeting his Malaysian wife. That was close to 13 years ago. Today, you can see that the country has had an influence on him in the way he talks — fluent English sprinkled with Malay words. At first, Taro set up a property development company that focused on boutique bungalows. Then three years ago, heeding his father’s request, he returned to the family business and has headed the Malaysian branch of Marimo ever since. Taro and his team are now gearing up for the launch of Marimo Land’s maiden project in Malaysia — lifestyle condominium O’hako @ Puchong Jaya in Puchong, Selangor. He is targeting an official launch in the middle of June. The project is due to be completed in three years. In the past, condos were not seen as good investments for a variety of reasons. However, Taro says that perception has changed. Being a father of three children, he is making sure that more than one-third of the 4.25-acre development will be allocated for green and outdoor facilities. “I bought two adjoining parcels and only plan to build two towers because I want to provide more [open] space. I want children to have a safe area to play in. I also want my children to touch more soil than paper in a safe environment,” he says. The freehold O’hako is located in Jalan Pipit, Bandar Puchong Jaya, which is well known for its traffic congestion. “One of the frequently asked questions is the condition of the road. I want to be honest with everyone — there is a traffic problem and the reason is the area has limited access roads. To solve this problem, Marimo Land will help upgrade Jalan Pipit,” says Taro. Despite the traffic problem and general slowdown in the property market, both towers have recorded an average pre-booking of 70% since they were opened for registration at end-2014. Taro was never worried about the market and the response is within his expectations. O’hako has a gross development value of RM370 million. The two towers will house 359 units each and every unit will come with two parking bays. There will be close to 2,000 parking lots in the condominium. 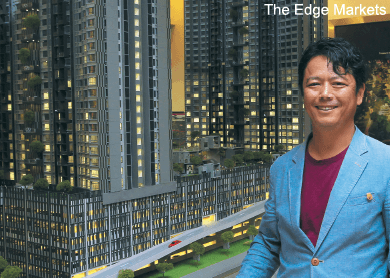 The built-ups will range from 800 to 1,000 sq ft and the condos will be priced at RM480,000 to RM600,000 or RM500 to RM600 per sq ft. Taro points out that O’hako is priced lower than similar new launches in property hot spots that average RM600 to RM1,000 psf. According to Henry Butcher Marketing Sdn Bhd chief operating officer Tang Chee Meng, property prices in Bandar Puchong Jaya shot up over the last few years as more young people shifted their attention to the area. The older condos and apartments such as Impian Heights and Bayu Apartments are being sold for RM300 psf while slightly newer developments such as Zefer Hill Residence and Atmosfera are transacting at RM450 to RM500 psf. “Those launched over the past one to two years, such as Parc Ville and Skypod, were priced at around RM500 psf. More recent projects such as O’hako (RM500 to RM600 psf), Twinz Residences (RM600 psf) and Skyz Residence (RM600 to RM650 psf) indicate a continued upward trend in price,” Tang adds. “By psf, the price is actually not very cheap but those who booked [units in the development] think it is and find the design very nice. They all think that we will not be able to get a good profit from the project,” Taro quips. Taro’s background in architecture and specialisation in master planning have helped the development. As an architect, he believes a strong concept can bring success to a project. O’hako means “a box of surprises” in Japanese and the concept incorporates that by having surprises and inspiration within the development. Besides standard condominium amenities, it will have more facilities with an emphasis on lifestyle, such as a wide jogging and children cycling track, skate ramp, treehouse, children’s gym, viewing pavilion and modern art lounge, floating wedding stage and huge party space that can cater for up to 1,000 people. There will also be a tuition centre and kindergarten within the development. For these to be sustainable, 30% of the students will have to come from the neighbourhood. Once the project is completed, Marimo Land will move its office from IOI Boulevard in Puchong to O’hako. There will also be a Marimo conceptual lounge within the development that will showcase future projects. “We will not run away, in fact we will move in. We also hope to manage the condo and work with the community,” says Taro. Nevertheless, (market) size does not matter, but potential does, says Taro. As Kajang is far from the city centre and Kepong property prices have increased dramatically due to Desa ParkCity, Taro finally settled on Puchong. While sales in Bandar Puchong Jaya have slowed due to a large increase in supply, overall softer market conditions and a higher loan rejection rate, Henry Butcher’s Tang believes the outlook for the area is positive. Moving forward, Marimo Land will continue to focus on Puchong. However, Taro declines to disclose more details except that the next project may be a joint-venture high-rise development. “Maybe next year, we will announce a new project, but it’s too soon to talk about it now. One thing is for sure, we have enough capital to work on new projects and we will acquire more land if the opportunity arises,” says Taro. Tang believes the trend of lifestyle condominiums will continue to grow as buyers become more sophisticated in their tastes and preferences. “As our country progresses and matures, and its citizens become more well-travelled and exposed to the higher standards of living overseas, there will be an increase in expectations and house buyers will not just settle for a basic roof over their heads. “Buyers have begun to clamour for better living environment, more stylish designs and concepts and more amenities. To satisfy these expectations, developers have no choice but to incorporate into their projects features that are more lifestyle oriented. If they fail to do so, they will not be able to attract buyers and they will not be able to fetch good prices for their products,” says Tang. Japanese companies are known for their honesty, quality, efficiency and being service oriented. Besides promoting the company through exhibitions and roadshows, he is also building up its team. “I am here for the long haul. I foresee condos currently priced at around RM500,000 could go up to RM1 million anytime. Even shoplot prices [here] are more expensive than in Japan. I think Malaysia has promising potential,” says Taro.